Though the first delivery of half dollars during 1795 was from dies dated 1794, the remaining deliveries dated with the current year were generous enough to make this a collectable type coin. 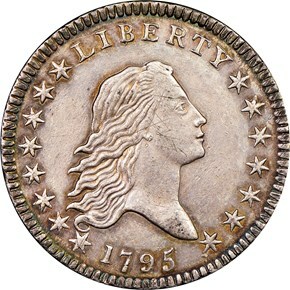 Most of the 1795 half dollars were coined from dies having a master bust with just a single line to mark the truncation of Liberty's portrait. A few of the dies feature an additional curve below the truncation line, mimicking the appearance of a bust cut in stone. This second portrait is referred to as either the Small or Narrow Bust, though few collectors seek it as a separate sub-type of the primary design. A total of 19 obverse and 22 reverse dies are known to have been used in various combinations, resulting in some 32 die marriages for the date. Just a single reverse is found with three leaves under each wing in place of the usual two (Overton-111). 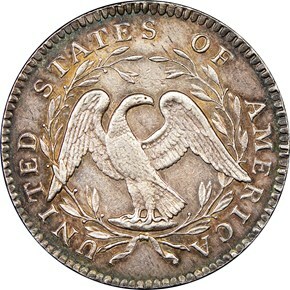 This reverse is paired with an obverse having a boldly doubled date, that same obverse die being used also with O-112. The rarest die marriages are O-118 and O-132, both of which have been reported but remain unconfirmed in recent years. Several other marriages are rated Rarity-6 (13-30 known), though the number of persons attempting completeness for this date is limited. Most collectors seek only a single piece for their type sets, and examples grading higher than Very Fine are scarce. Most 1795 half dollars will fail to achieve numeric grades, due to improper cleaning, damage or holing for suspension and, in many cases, repairing of the holes. Another impairment, though one that does not preclude numeric grading, is the presence of adjustment lines. Planchets found to be over the legal weight tolerance were filed across their faces until meeting the proper weight, and these deep lines frequently remained after the coins were struck. 9/20/2012 — Heritage So Cal Signature Sales Net Nearly $19 Million. British India Still On Fire — NGC 1911–C Proof Set Commands $47,000. Early US Circ Type Coins Harder To Find.